Michael Ruppert was quoted in this article saying that the 9/11 Truth Movement is a circus. I don't agree with his assessment. I couldn't find the article to provide a link at JSOnline.com so I took a scan of the article and retyped word for word for you to read. Campus Newspaper's article "9/11 Truth Movement Continues to Grow"
I am an older college student. The Texas A & M - Commerce campus newspaper, "The East Texan", asked me late one night if I could submit an article as a guest columnist. The article was due the next day. I pounded the keys till past midnight, giving the article to the Editor who was still at her post. The May issue of the Rock Creek Free Press is on news stands now. The May issue of the Rock Creek Free Press is on news stands now. This is our biggest 9/11 issue yet with eight articles relating to 9/11 including articles about; Jesse Ventura, Margaret Cho, Larry Silverstein, and others including a Paul Craig Roberts review of The Shell Game. This issue also features a huge two page centerfold spread called “10 False-Flag Operations that Shaped Our World”, by Joe Crubaugh. It is a fantastic tableau of false-flag treachery reaching all the way from Nero in ancient Rome, through the Reichstag fire, Operation Northwoods, Tonkin Gulf, to the greatest, most horrendous false flag of all time, the 9/11 attacks of 2001. It is a powerful history lesson for those doubters who say no government would intentionally harm its own citizens. The Rock Creek Free Press is the only paper in Washington DC that will print the truth about the perilous condition of our republic with stories such as “Torture Directed from White House” and “COINTELPRO Infiltrating the Anti-War Movement.” We print the stories the corporate media refuses to cover. Ms. Gloriya Freeland of High View, W Va., in a letter to the editor published by the Cumberland Times News Apr 14, hands the official 9/11 story a verbal spanking so bad, that I would be cringing if I were GW Bush and read newspapers. Go Libraries! Hampshire Co, W Va. rocks! "The presenters posed many additional facts which space does not provide. If courage to know truth can get your mindset past its self-imposed need for comfort from conspiracy theories, go to www.911truth.org for more. Be a brave patriot! Hampshire's library has DVDs to check out." The last time I took copious notes was in grad school, that is, until March 14's 9/11 Truth's presentation at the Hampshire County Library. The fourth edition of The Liberty Voice has been released commemorating the fifth anniversary of the Iraq War with fiercely independent news and commentary. “From Steven Colbert to GlobalResearch.com, it'll make you laugh and then cry,” says publisher, Sherry Clark, co-founder of Columbus911Truth.org. Funded by generous patriots and subscribers across the county, the paper has not yet had to solicit advertisements, keeping the content decision standards truly independent. On 9/11: Is the Struggle for Truth Worth It? An excellent opinion piece appeared yesterday in the Arizona Daily Sun. Tom Gorman asks thought-provoking questions, places the 9/11-truth movement in perspective -- and reminds us to keep sending Letters to local newspapers! On 9/11 attacks: Is the struggle for truth worth it? A recent poll cited on the MSNBC Tucker Carlson show indicated the one third of Americans believe the government was somehow complicit in the 9/11 attacks. The 9/11 Truth activists are becoming more visible (HBO Bill Maher show) and stepping up their campaign in confronting candidates such as "9/11" Rudy Giuliani. As the election year soon descends upon us, I was wondering why some citizens bother to seek truth and justice. In social movements of the past to eliminate slavery or apartheid, or for voting rights or civil rights, the activist vanguard are at first detested and scorned by the ruling minority and the public majority. Also, mass denial of the issues may make progress toward resolving inequalities or corruption a long and winding road with many detours and setbacks. This goes along with what an intelligent patriot said on this site about the education of the police on tyranny (dated 07/12/2007 “Want to Win this Information War Fast? Here Is How!!!). Thanks to “LUCUS” for his post which got me brainstorming. This idea, may not be new but here it goes…Some people listen to police scanners, reporters do…..when there is a news story which has television coverage “truthers” with hats, shirts, posters, should get into the shots, even if it is only for a second at a time. If we can flood the news reports with truth seekers in the background either “they”, the editors will not use the story, or they will run the story…with editing of course. If we can get into enough shots, the message will get out to the population whose only source of information is the newspapers, and news channels on TV. If we can get into enough shots, either we will stop the news altogether or they might run it and show us in the background. Just a thought, not sure how plausible it is. This article was published on The image. 05.03.07. 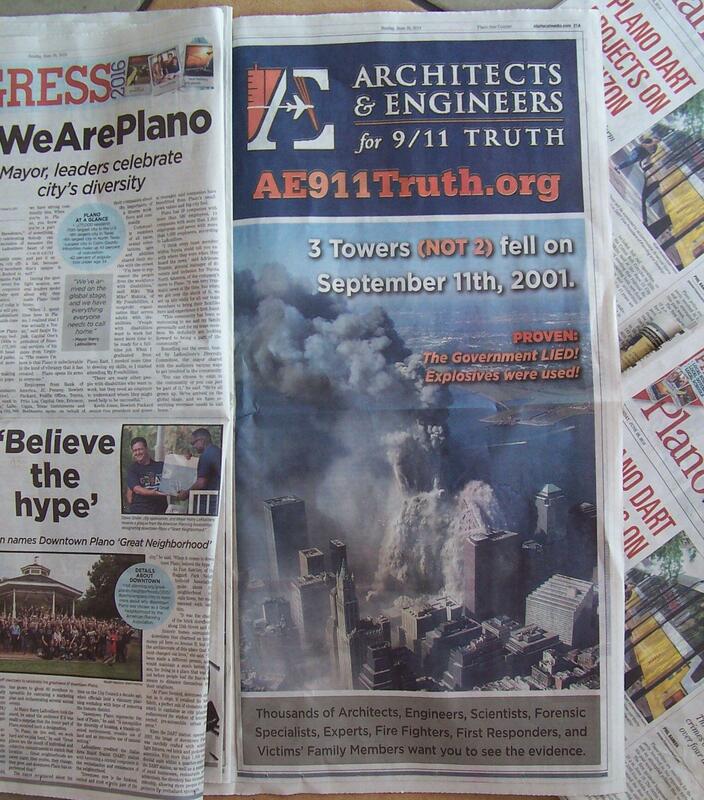 9/11 Activists create newspaper to cover 9/11 Truth. Rock Creek Free Press will release its first issue to coincide with the Jan 27 Peace March on Washington. While the paper is not exclusively dedicated to 9/11 truth, it is one of the main topics we will cover. The first issue has no less than 5 articles on 9/11, including articles by Webster Tarpley and Wayne Madsen. In addition, Cynthia McKinney writes about the need for impeachment, while Louis Wolf writes about the looming conflict with Iran, and much more. Read it now at http://RockCreekFreePress.com. Most of the first press run of 10,000 copies will be distributed at the January 27th peace march on Washington, but copies of the paper will be available to interested 9/11 truth activists across the country. To get your copy, visit the RockCreekFreePress.com website and click on SUBSCRIBE. I will send you a copy of the paper at no charge and with no obligation. We are already planning the next issue which will be dedicated exclusively to 9/11truth. We are designing that issue to be an educational tool for 9/11 truth groups across the country. The newspaper format permits us to produce an expansive and powerful educational tool at a very low cost. If that sounds like something your local 9/11 truth group would be interested in, please contact me through the website, RockCreekFreePress.com. If you would like to write, or you have already written, an article about 9/11 and would like to have it published, there is a place on the website for you to submit your article. If your 911truth group is planning an event, or you have a book, DVD, T-shirt, bumper sticker or other product useful to the 911truth community that you would like us to advertise, that too can be submitted from the website. With your support, I intend to publish "The Creek" as often as I can, and make it available around all the power centers of Washington. Even if the Senators and Congress people don't read it, if their cab driver, the doorman, waiters, and others around them do, it can't help but have an impact. And who knows, maybe even congressional staffers and a few lawmakers will have the courage to pick up a copy. Come to Washington this weekend to demand the truth. dc911truth.org has all the details.